I’m going to start my review with a simple injunction: read this book. Comprende? Good. Let’s move on. I first become aware of Notes from the Tilt-A-Whirl a couple years ago, but I never gave it more than a passing glance. In hindsight, I must say that’s really too bad – this is a book I wish I had read much sooner than I did. But lest you think this is some sort of fuzzy-brained sentimentalist cakewalk, rest assured – it’s nothing of the sort. Childlike? Yes. Childish? Not on your life. Wilson may write with the whimsy of A.A. Milne, but he has the sharp-edged theological insight of a surgeon’s scalpel. He’ll nick you; more likely than not, he’ll slice you right open. But like every good surgeon, he won’t leave you that way; and when all is said and done, you’ll be glad you went under his knife. The quality of writing throughout is top-notch. Actually, it’s several notches above top-notch. High praise, I know, but well deserved. It’s engaging, poignant, funny, and profound. You’ll laugh, you’ll pump your fist, and you’ll probably tear up (I did). You’ll find wordcraft in this book as enjoyable as anything found in a novel. If, by some chance, you are still unconvinced that this is a must-read, then I fear there is little hope for you. I was asked to give this book a star rating. Five stars is generally the highest, but I’m going to break the rules and give this one six. Anything less just wouldn’t do it justice. 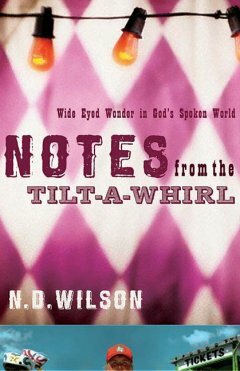 Finally, be sure to enter Josh’s giveaway if you’re interested in winning a copy of Notes from the Tilt-a-Whirl for your own bookshelf! Yeah, I comprendo. But all in all an excellent post and that last quote is one of the of the best I’ve seen in a while and one of the truest as well. If I don’t want to enter to win a copy where can I find one remotely cheap? Amazon sells it, and it’s also available from Westminster Bookstore. Okay, thanks old buddy, old friend, old pal. Right? Very good! I saw the movie… book – umentry? Excellent. He is very deep. I love that book, too. Last night I watched the movie for the second time, and that led me to pull the book back off the shelf and review the highlighted parts. I am! N. D. Wilson is fantastic! I love how open and frank and hilarious he is about things. Even before this review, you sold me on getting a copy! Thanks a very informative review! Six stars? This must be an outstanding book. Looks like another one is added to my growing wish list. I left a comment on Josh’s blog, but just had to come over here to reiterate how much I agree with your review! Bravo! And yes, definitely six stars. The Simple Gospel, Simply Presented, Is Simply Profound. I’ve nominated you for the “Very Inspiring Blogger” Award! You can read more about it at http://pastorchrisjordan.wordpress.com/. Thank you for sharing your heart and words… God Bless you, your family, and your ministry. Congratulations! i wish i could have one…God bless u bro!! !